A is for apple. But it’s also for amazing, awesome and altogether-too-cool. 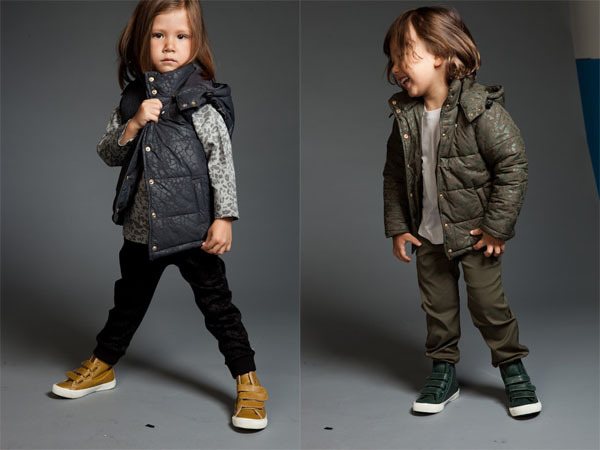 Which pretty much sums up what we think of kids’ fashion newcomer A For Apple. 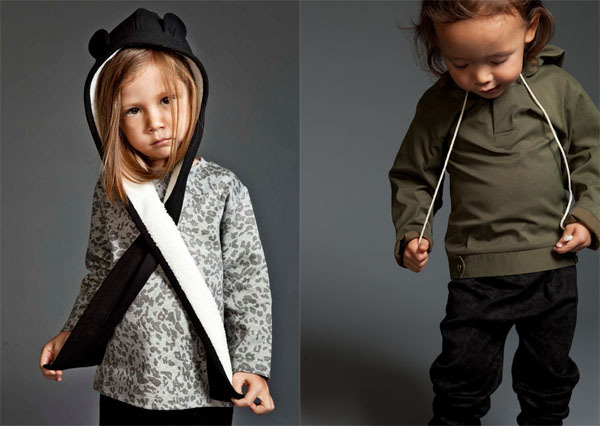 We discovered A For Apple at the recent Playtime New York trade show and couldn’t wait to give you a closer look at their threads, designed with little city dwellers in mind. Completely hip and ultra edgy, these are clothes made for urban playgrounds, with narry a frill nor cutesy embellished tee to be seen. Instead, Hong Kong-based designer Denise Ho serves up a palette of blacks, greys, khakis, blues and browns in a striking collection for mini sophisticates that – though you’d never ever for a single second confuse it with pretty – is absolutely, positively blow-your-mind beautiful. The theme here, if all that khaki wasn’t already a dead giveaway, is safari. So animal prints abound – in leopard, elephant and giraffe varieties on pants, tops, leggings, tees, onesies and even on the parker-style jackets and vests. Then there’s the adorable faux fur-lined snood (below left) with its jaunty little animal ears. I dare you not to want one too. Many of the pieces in the collection are unisex and made from Tencel, which is environmentally sustainable and just the thing for sensitive skin. It appears in a thermal blend for the infant onesies and a super-soft wash for the denims. This is a winter collection for the northern hemisphere and yes, we’ve officially hit spring here in Australia. But I live in Melbourne, where the weather in springtime and even into early summer is as fickle as can be, so I’m sure to get quite a few days’ wear from these for my kids before they’re into sundresses and board shorts. Ditto for our Tasmanian followers, I’m sure. A For Apple comes in sizes to fit from twelve months to five years. There is no Australian stockist yet but please, dry your tears. You can buy your fill of this stunning new label direct from their website because Denise assures us they will happily ship to Australia.